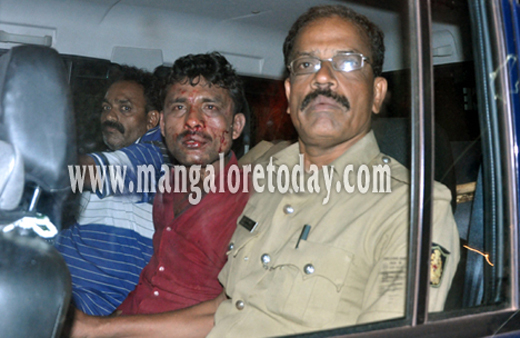 Mangaluru, April 6, 2015 : A young man who was found jumping over the compound wall of a house near Kolya was caught hold of by the public and duly thrashed before handing him over to the cops. The incident was reported on April 5, Sunday night near the Shree Mookambika Temple at Kolya, close by the National Highway. That the locals grew more suspicious about the youth identified as Sattar(25) from Mastikatte was the fact that gold worth several lakhs were stolen from a nearby house a few days ago. It has been gathered that Sattar was trapped by locals from inside a compound close by the temple where he remained in hiding when he learnt that the public had spotted him climbing the compound wall of a house. If one suspicion was that he was under the influence of drugs when committing the act, some others say four others had accompanied Sattar before he climbed the compound wall. It has been gathered that Sattar worked for a textile shop in Mangaluru and was often spotted pleading money from people. It is also alleged that he even resorted to pick pocketing. The Ullal Police later took him to custody and subjected him to medical examination at a hospital.